We haven’t done a lot of restaurant reviews on the blog in the past. Which is a shame, really, because we love food. We’re the type of people who plan their entire day around food. And I think we can all agree that what we eat abroad forms an integral part of not only understanding the local culture but also forming many of the fundamental travel memories we take home with us. So it’s with this in mind that we’ve decided to add a few destination-specific restaurant reviews—but only if we find the experience adds a ‘dash of class’ to our travel adventures. 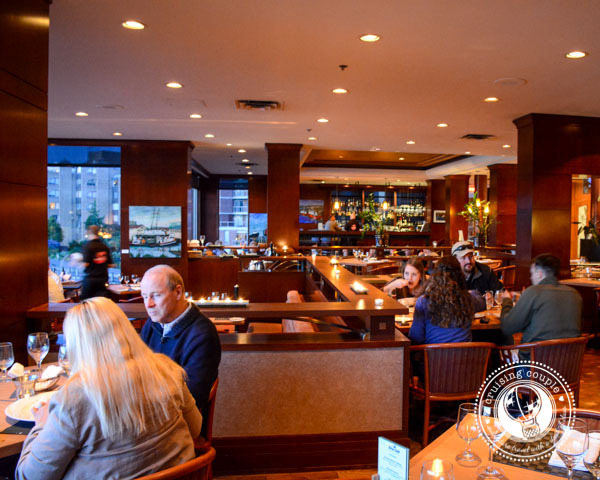 Today we’re featuring the Blue Crab Seafood Restaurant in Victoria, British Columbia. We had the opportunity to wine and dine here during our #GreatCoastRoadTrip; it was an experience so delectable, we’re still thinking about it nearly two months later. 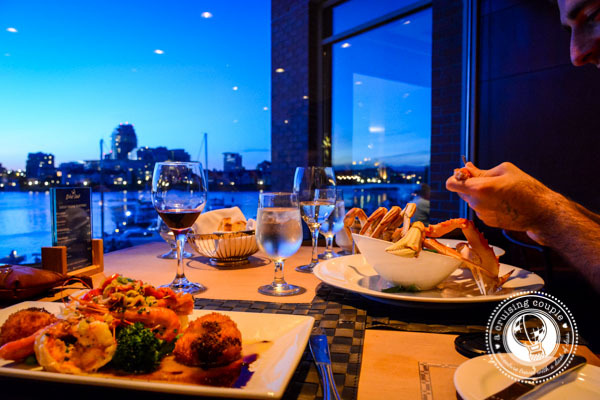 It might sound like a pretense, but literally every time we told someone in Tsawwassen or Nanaimo that we were staying at the Coast Victoria Harbourside Hotel, we got the same response: You’ve made your reservations for The Blue Crab, right?! 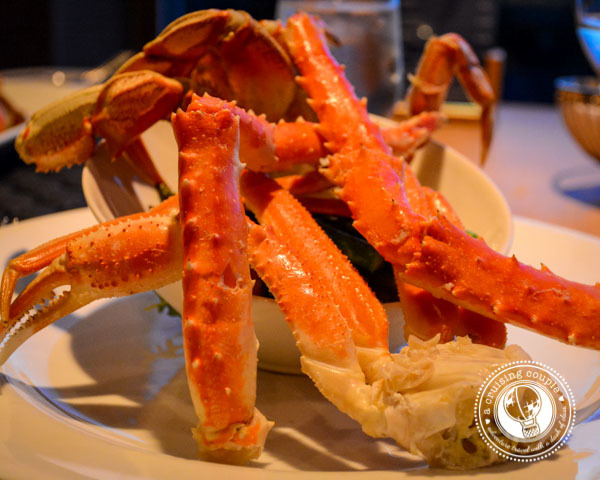 The Blue Crab Seafood House is known for its innovative menu, featuring fresh and local ingredients, creative interpretations on classic dishes, and tasteful food and drink presentations. On our arrival, we were whisked through the lobby of hopeful patrons to our romantic seats next to the wall-to-wall window, boasting delightful views of the harbor with its seaplanes taking off and its water taxis gracefully floating past. Still exhilarated from our bungee jumping experience earlier that day, we couldn’t help but chatter about it nonstop—even to our very busy waiter, who remained superbly attentive and convincingly interested in our tale of jumping off bridges. But we were really impressed with the wait staff when we explained our wine debacle: we always prefer red wine to white, but we had come to The Blue Crab for seafood—what was a couple to do? Thankfully the manager, Heather, made an excellent wine recommendation that would pair well with our entire meal. Things were off to a good start. The important question of what wine to drink aside, it was time to get into the menu. Although not extensive, the house menu coupled with the specials menu still gave us too many mouth-watering choices to choose from. Heeding the advice of our waiter, we decided to hold nothing back and opt for two appetizers: Scallops & Bacon and Fresh Oysters! Normally bacon and anything is a brilliant idea, and the scallops did not disappoint. The bite-sized bundles were nothing less than an explosion of flavor, the tender scallops expertly paired with sweet and thick maple glazed bacon. And don’t get me started on the oysters… Served raw with lemon, horseradish and mignonette, they were subtle but flavorful, exactly how we like them. With our initial hunger pains now satiated, it was time to get serious and choose the main course. I had the hardest time choosing between the Classic King and Snow Crab versus the local Dungeness Crab. Luckily the Blue Crab’s signature plate comes with all three crab varieties in one big crabby bowl, a slew of veggies on the side. Sweet and mild, the King Crab ultimately turned out to be my favorite, but I was very glad to have tried the other two as well. Casey decided it was entirely too much work to spend her night fighting with a crab cracker. Instead she opted for the Prawns For You, a limited edition menu item as part of the Blue Crab’s Prawn Fest. 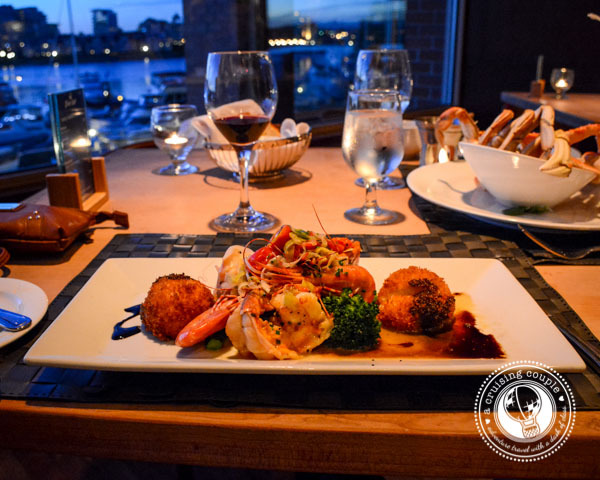 The plate included grilled lemon jump prawns in a basil roasted cherry tomato broth, prawn and King crab arancinis (stuffed rice balls coated with breadcrumbs and fried), and a crispy spot prawn with balsamic reduction. In the end she decided that perhaps she had been a bit overzealous, the prawns delicious but just a bit too prawny. A good hour and a half later (it took me a long time to eat all that crab! ), the dessert menu came rolling it. And as soon as we saw it featured a Chocolate Lover, we decided to throw any last remaining self-control to the wind. 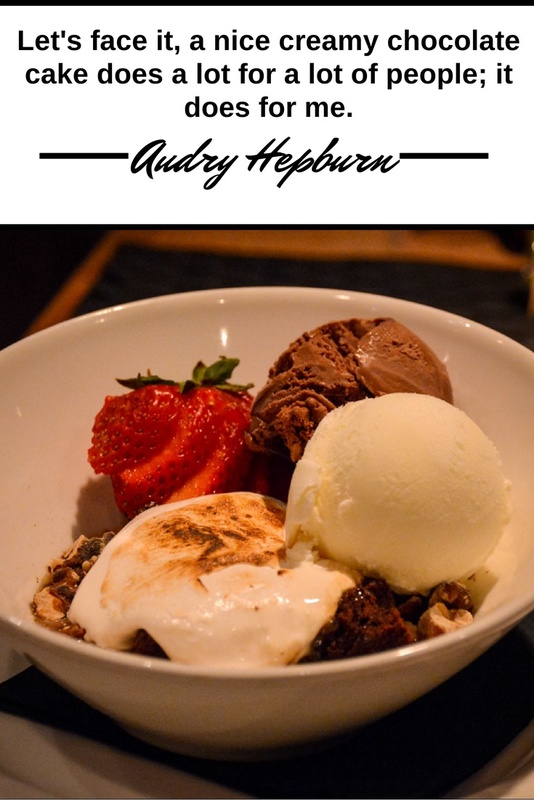 A flourless chocolate cake with caramel, candied walnuts, vanilla ice cream, and marshmallows, it proved just as rich and decadent as we had hoped it would be. To wash it down, we opted for a Spiced Chai Latte (with liquor). It was a bit strong for even Casey’s taste, though we didn’t have any problem gulping it down. If there’s anything we’re willing to splurge on, it’s good food with a great view. Luckily, The Blue Crab fit the bill on both accounts. Our only disgruntlement was that we couldn’t possibly fit any more food into our stomachs—which meant we had to leave without sampling the restaurant’s Signature Crab Cakes. Alas, at least we have a reason to return. 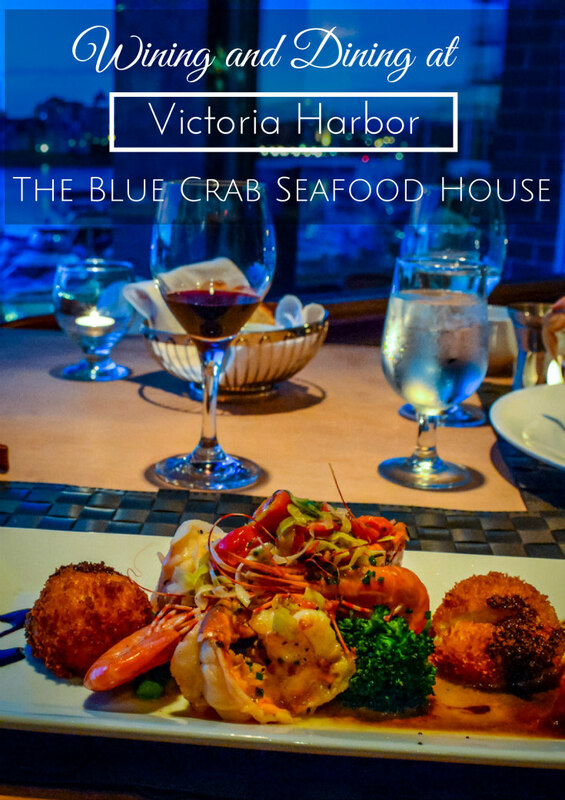 The Blue Crab Seafood House is located within the Coast Victoria Harbourside Hotel and Marina. Reservations strongly recommended. For two cocktails, two glasses of wine, an appetizer, two mains and a dessert, expect to pay around $150, though this figure is certainly variable. 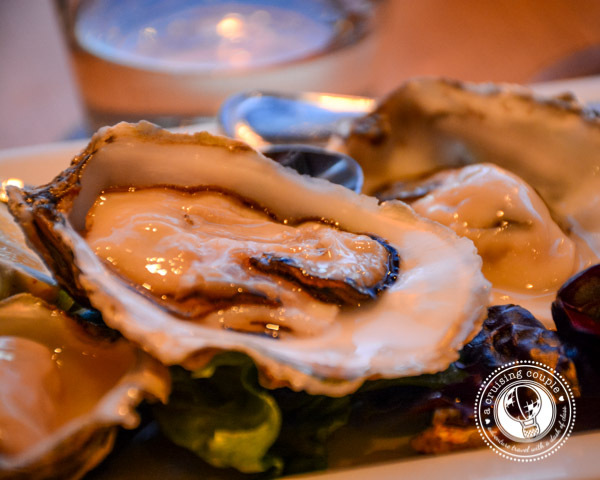 We were guests of The Blue Crab Seafood House during our #GreatCoastRoadTrip. We were not asked to write a restaurant review; all thoughts and opinions remain our own. Are you a seafood fan? What’s the most memorable seaside dinner you’ve ever had? This place looks fantastic, and the food does it too!!! Oh my gosh, YES!! I had an anniversary dinner here once, and it was wonderful. So jealous you got to have spot prawns… that’s my favorite season on the west coast. 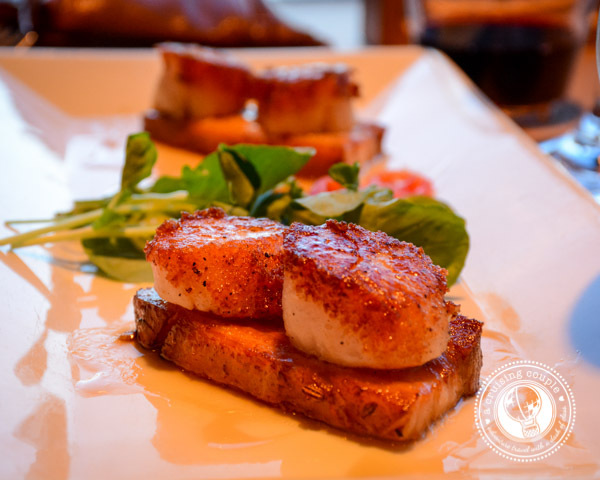 You had me at bacon scallops…drool! Looks fantastic! We love crab legs and that is one thing we actually can’t find at all in Italy. Those scallops looks delicious too.